When it comes to safety, it's easy to understand why plants across the globe love using Safety Boy flange spreaders. Gone are the days of using cumbersome and dangerous hammers and chisels to get the job done. The worry that a spark might be created is eliminated. 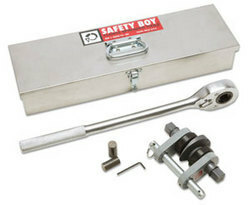 Safety Boy uses torque instead, making it an efficient and much safer way to separate flanges. Using our Safety Boy products is stress-free. You will be amazed at how much time and effort you save with these innovative and professional tools. To operate any of our flange spreaders, simply apply pressure to the ratchet handle. Doing so forces a circular cam wedge between flanges to make the separation.